The Saranathan Temple in Thirucherai, a village in the outskirts of Kumbakonam in the South Indian state of Tamil Nadu, is dedicated to the Hindu god Vishnu. Constructed in the Dravidian style of architecture, the temple is glorified in the Divya Prabandha, the early medieval Tamil canon of the Azhwar saints from the 6th–9th centuries AD. 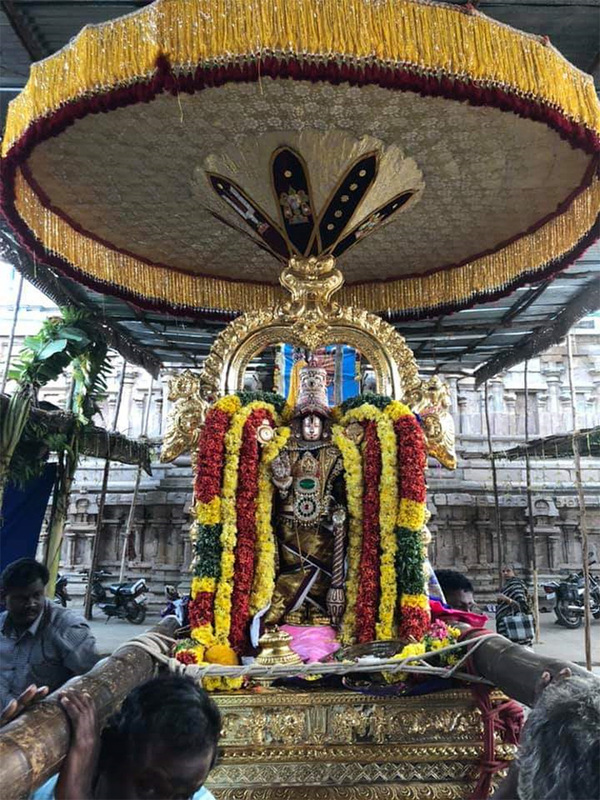 It is one of the 108 Divyadesam dedicated to Vishnu, who is worshipped as Saranathan and his consort Lakshmi as Saranayaki. It is believed that Saranathan appeared for Cauvery, the river goddess, who performed penance at this place. The temple is believed to be of significant antiquity with contributions at different times from Medieval Cholas, Vijayanagar Empire and Madurai Nayaks. A granite wall surrounds the temple, enclosing all its shrines and three of the four bodies of water. The rajagopuram, the temple's gateway tower has five tiers and raises to a height of 120 ft (37 m). The temple is unique where the presiding deity Vishnu has five consorts. It has also a shrine dedicated to river Cauvery, which is unique feature among all Vishnu temples. Saranathan is believed to have appeared to river Cauvery, sage Markandeya and Hindu gods Indra. 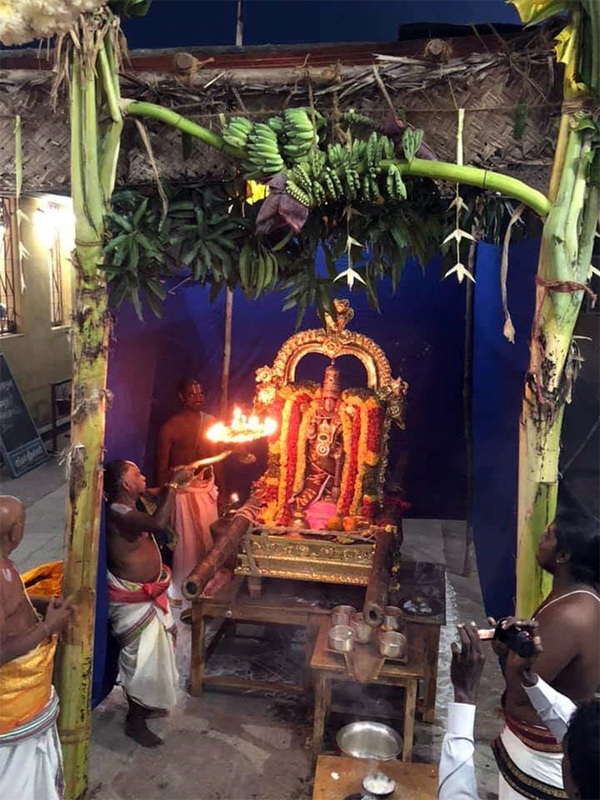 Six daily rituals and three yearly festivals are held at the temple, of which the chariot festival, celebrated during the Tamil month of Chittirai (March–April), is the most prominent. The temple is maintained and administered by the Hindu Religious and Endowment Board of the Government of Tamil Nadu. The temple priests perform the pooja (rituals) during festivals and on a daily basis based on Vaiksana Agama. As at other Vishnu temples of Tamil Nadu, the priests belong to the Vaishnavaite community, a Brahmin sub-caste. The temple rituals are performed six times a day: Ushathkalam at 7 a.m., Kalasanthi at 8:00 a.m., Uchikalam at 12:00 p.m., Sayarakshai at 6:00 p.m., Irandamkalam at 7:00 p.m. and Ardha Jamam at 10:00 p.m. Each ritual has three steps: alangaram (decoration), neivethanam (food offering) and deepa aradanai (waving of lamps) for both Saranatha Perumal and Saranayagi. During the last step of worship, nagaswaram (pipe instrument) and tavil (percussion instrument) are played, religious instructions in the Vedas (sacred text) are recited by priests, and worshippers prostrate themselves in front of the temple mast. There are weekly, monthly and fortnightly rituals performed in the temple. The major festival, the twelve-day Brahmotsavam is celebrated during the Tamil month of Thai (January - February). It is believed that it only on the auspicious day of Pushya star of the month that Vishnu descended from Vaikuntam to earth to bestow Cauvery. Rathotsavam, the temple car is drawn during the ninth day of the festival. The other Vaishnavite festivals like Krishna Janmashtami, Karthigai, Tamil New Year, Margazhi ten-day festival, Sankaranthi, Panguni Uthiram and Rohini Utsavam are celebrated. 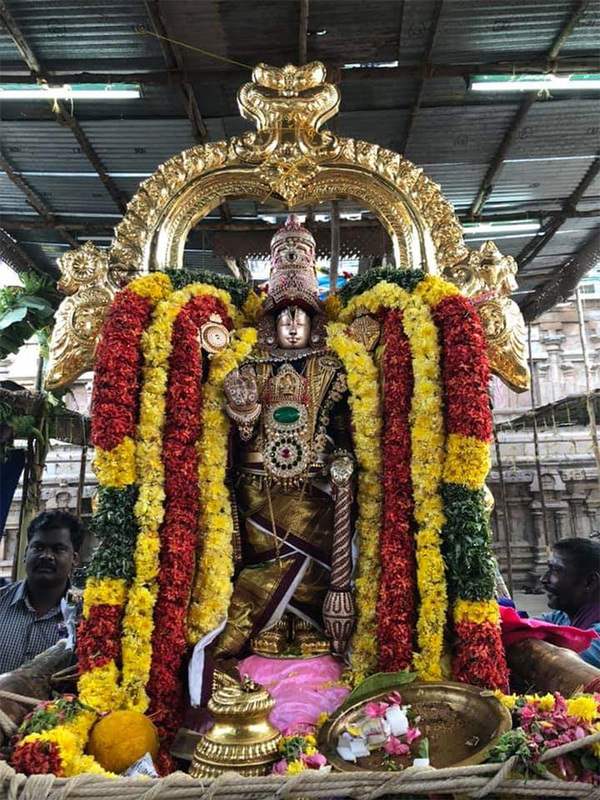 The following are some pictures and video from the Brahmotsavam festival at Sri Saranatha Perumal Temple in Thirucherai, Tamil Nadu.